Some 52 cruise ships carrying 128,900 passengers are expected to make a call at Bahrain’s Khalifa Bin Salman Port (KBSP), contributing directly to the country’s tourism sector. This will be the highest on record in terms of passengers till date, which witnessed a 33 per cent increase in the previous season, resulting in 105,271 cruise visitors and a 5 per cent growth in vessel calls. 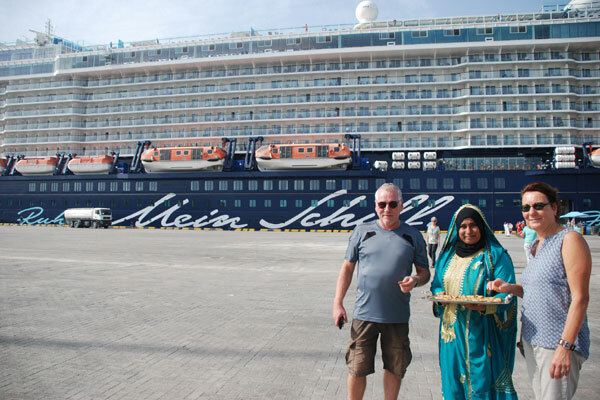 Bahrain’s main seaport marked the beginning of the 2018-19 Cruise Season as the first luxury ship of the year, Mein Schiff 4, recently docked at the port to a traditional Bahraini welcome. The 2018-19 cruise season is expected to attract more tourism business for Bahrain with some exciting new arrivals at Khalifa bin Salman Port. Four new cruise vessels, led by AIDAprima with its 3,300 passengers with 900 crew members, will be making its maiden call to the Kingdom with 18 scheduled trips planned for the season. This will be followed by MSC Lirica with eight trips and other vessels including the TUI Discovery and Thomson Celebration, also marking their debut in Bahrain. Amongst the cruise vessels making their yearly call at KBSP, MSC Splendida will be returning to the Kingdom for the second season, with six scheduled visits, each carrying approximately 3,900 passengers with a crew team of 1,313, making it the biggest vessel to call this season. Mein Schiff also has repeated calls at KBSP with its 10 trips, each carrying 2,800 passengers. The cruise season will also witness docking of two cruise ships on the same day, over certain weeks of the scheduled season. APM Terminals Bahrain, operator of Khalifa Bin Salman Port, continues to make enhancements to its cruise facilities and areas adjacent to where passengers embark and disembark. The company has been working with various government agencies including the Bahrain Tourism and Exhibitions Authority (BTEA), Ports and Maritime Affairs (PMA), Directorate of Customs Sea port, Sea Port Police, National Security Agencies (NSA) and Nationality, Passports and Residence Affairs (NPRA) for the new cruise season. As part of the collaboration, steps have been taken to speed up processes such as: pre-approved gate passes for entry into the port, port shuttles to transport passengers to the gate, increased capacity for free wi-fi at the cruise terminal, allocated gates for tourist buses as well as booths for tour operators and taxi services at the passenger terminal. Passengers are welcomed with traditional Bahraini hospitality and cultural experiences that include Bahraini music along with falcon show at the BTEA-hosted tent.